From Bagan we took two days to ride out to the holy site of Mt. Popa and back just before the end of the year. 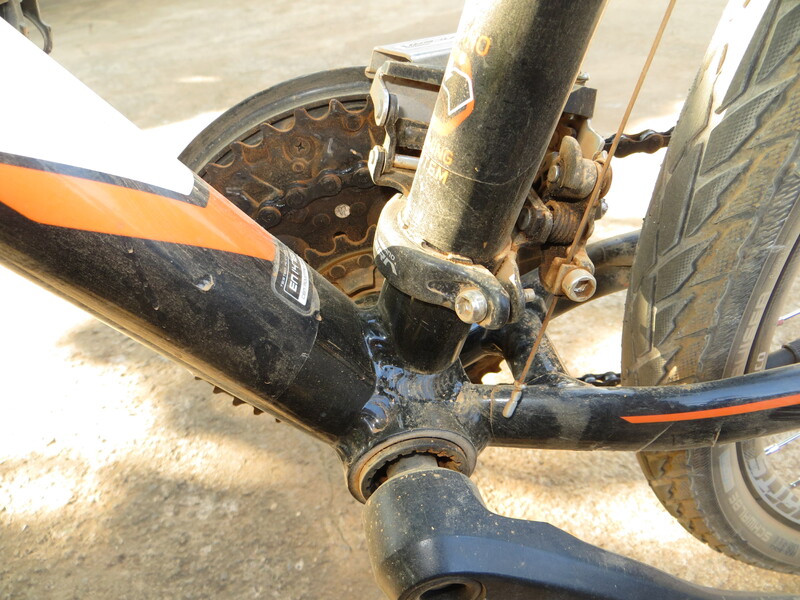 One of our last days of biking took us through some tough sandy roads on the outskirts of Bagan. 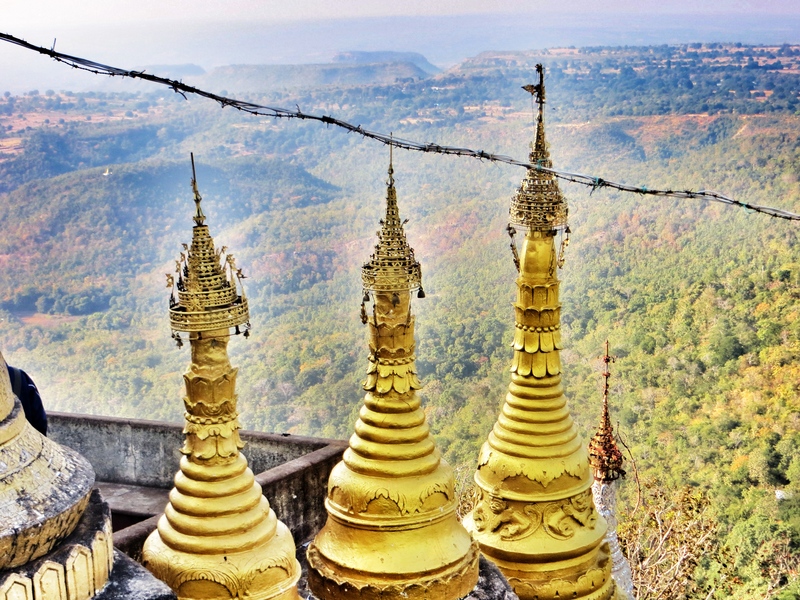 Our two-week bicycle tour of Myanmar came to a spectacular finish, along with the year 2013, in the stunning ancient Burmese capital of Bagan, where 10,000 temples, stupa, and pagodas crowd the flat landscape along the Irriwaddy river. We closed the tour — and the year — with a very long New Years Eve. 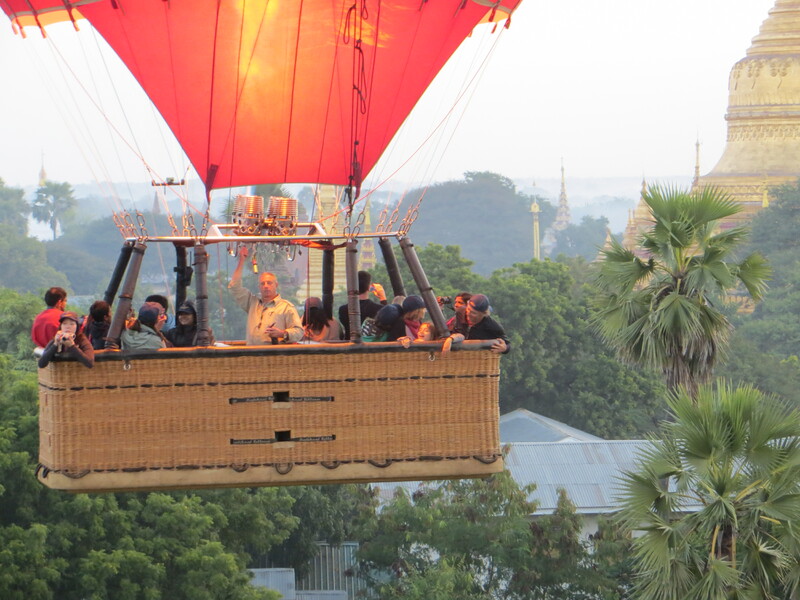 We got up at 5 am for a sunrise hot air balloon tour of Bagan. 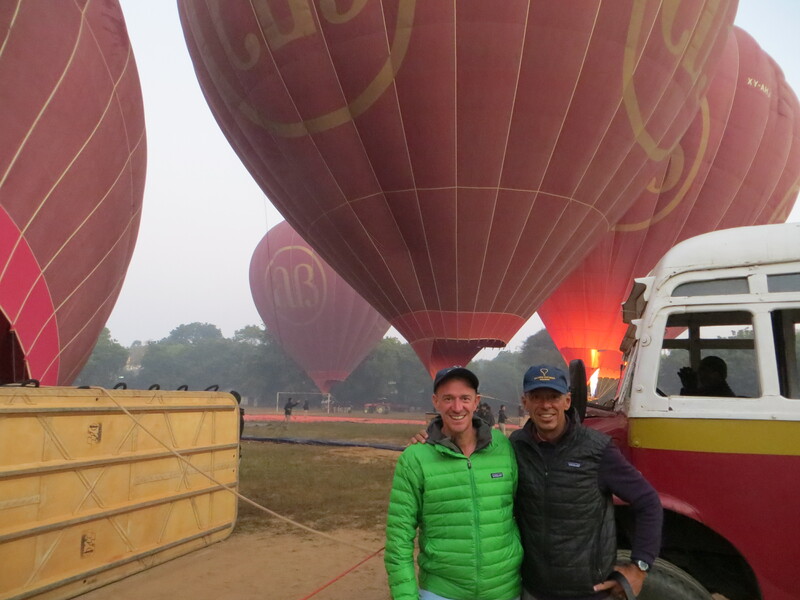 Neither of us had ever been in a balloon, and it was an incredible experience to float across this remarkable place — one of the world’s leading destinations for ballooning. 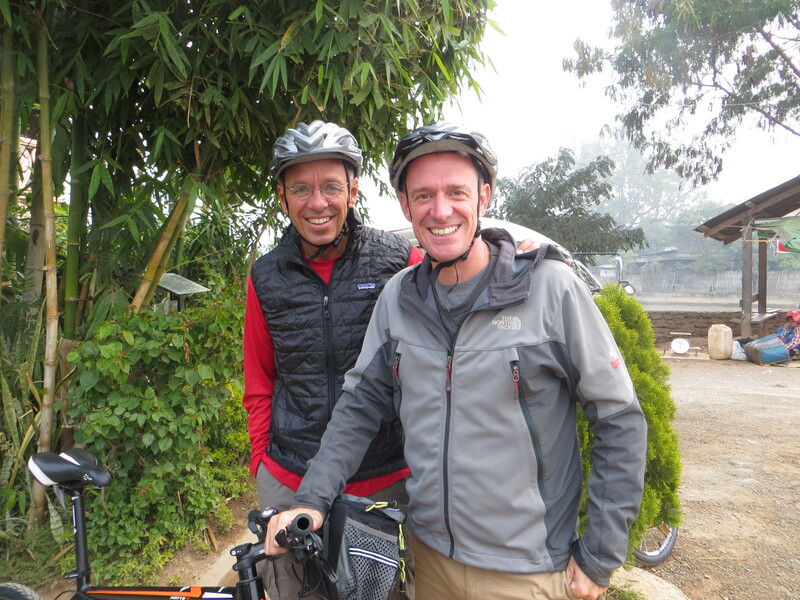 We spent the later morning on our last biking segment of the tour, pedaling to visit some of the most striking temples. 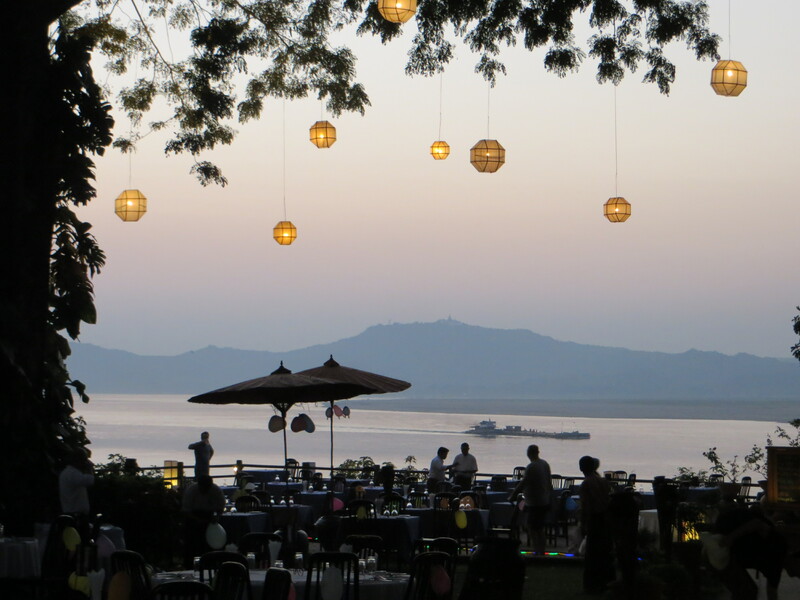 After watching the sun set over the temples, we then enjoyed a wonderful goodbye News Years Eve dinner with our five cycling companions and our guide, Chan, at our lodge on the riverside. Once midnight rolled around, many of the hotel’s staff were freed up to join the party. We had a blast dancing with them all until almost 1:30 in the morning. Happy New Year, everyone! Waiting as the balloons get prepped for our early morning departure. Not only was the landscape spectacular, but it was fascinating to watch the other balloons. 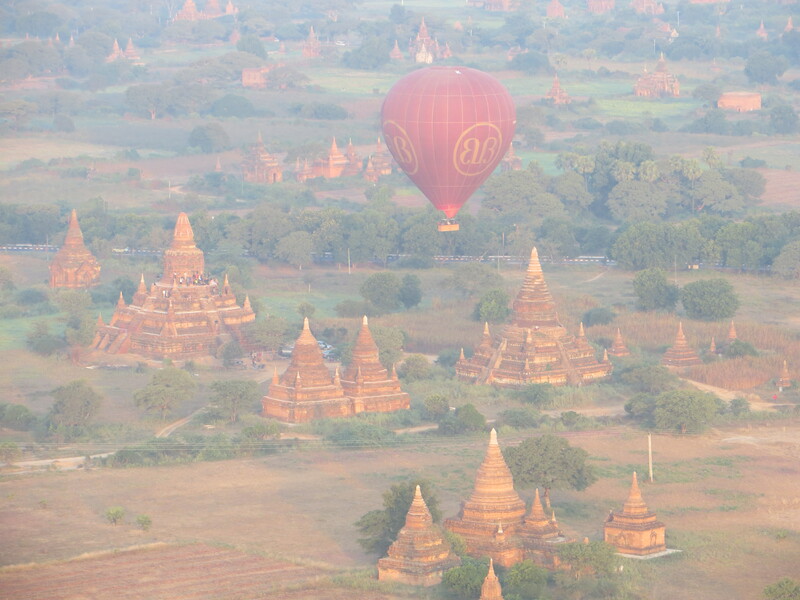 The temples of Bagan are an awesome backdrop for ballooning. Our riverside lodge was a fun place for a festive New Years Eve countdown. We’re well underway on our 13-day bike trip through Myanmar. We’ve learned a few things so far on the trip. One, the highlands where we’ve been biking so far get amazingly cold; at night I’ve been putting on every layer of clothing I can, since I haven’t really packed warm clothes. Second, it’s really hard to bicycle up long hills on dirt and gravel roads. Third, it’s really hard to bicycle down long hills on dirt and gravel roads. There are a lot of hills so far, and a lot of dirt and gravel. And lots of road construction, though almost shockingly little construction equipment; road construction is almost entirely a manual project here. We’ve been told that the construction workers earn $4 a day for the long, hot, and difficult work they do. It’s not all gravel. 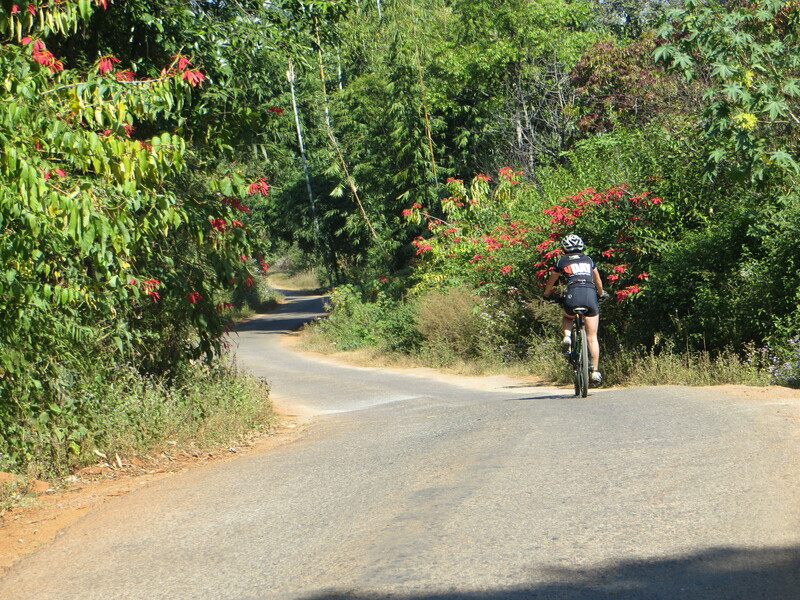 This is Marlene heading downhill on pavement surrounded by wild poinsettias. Appropriately, this was on Christmas Day. Another thing we’ve learned is that the people of Myanmar are just remarkable friendly, with the biggest smiles and happiest greetings. 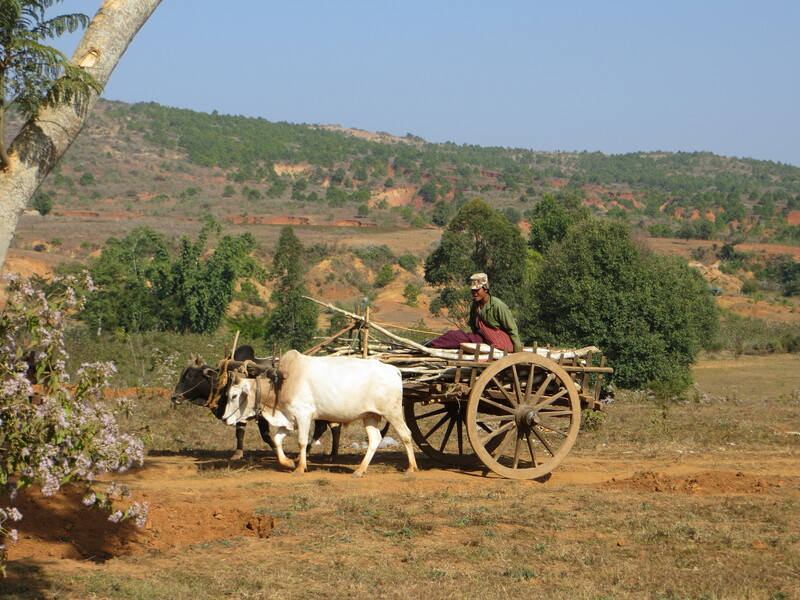 (Note that I didn’t refer to the Burmese; we’ve spent the first several days in Shan Province, populated with ethnic Shans, I’ve learned, not Burmese.) We’ve waved to untold numbers of kids smiling and waving and shouting to us. You just can’t help smiling at all the friendly faces we see. Finally, I’ve learned that we spend a lot of time in vans, a lot more than I’d have expected. At first I thought it was strange that we wouldn’t just ride like we did in Italy and like I’ve done on other rides: you get on the bike and ride 30 or 50 or 60 miles to a town, stay there, then bike the next day to the next town. After a couple days, though, I figured it out, and it’s not complicated. 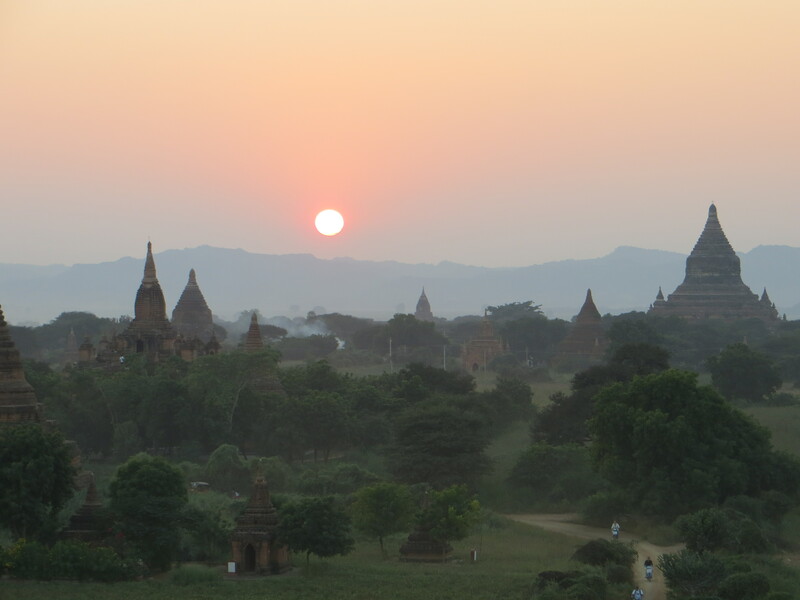 The tourist industry in Myanmar is less developed than the tourist industry in Italy. Who’d have guessed? It turns out you can’t just ride from cute inn or guesthouse or lodge to cute inn or guesthouse or lodge; there aren’t that many of them here. So instead we typically get in the van, drive to the starting point where the other van has brought our bikes, ride for several hours, and then get driven into whatever town or city we’re staying in that night. 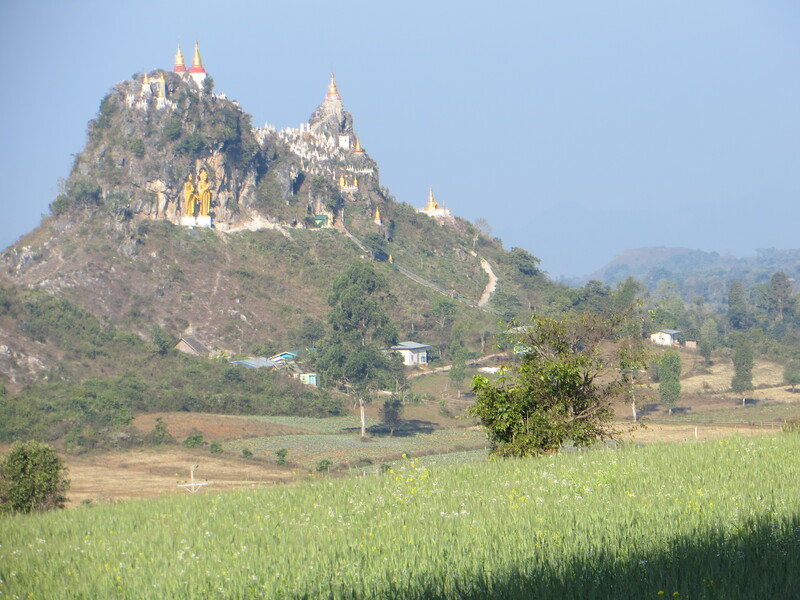 It’s perhaps not my fantasy of a bike tour, but it’s still a fascinating way to see Myanmar. And every morning they magically look like this! 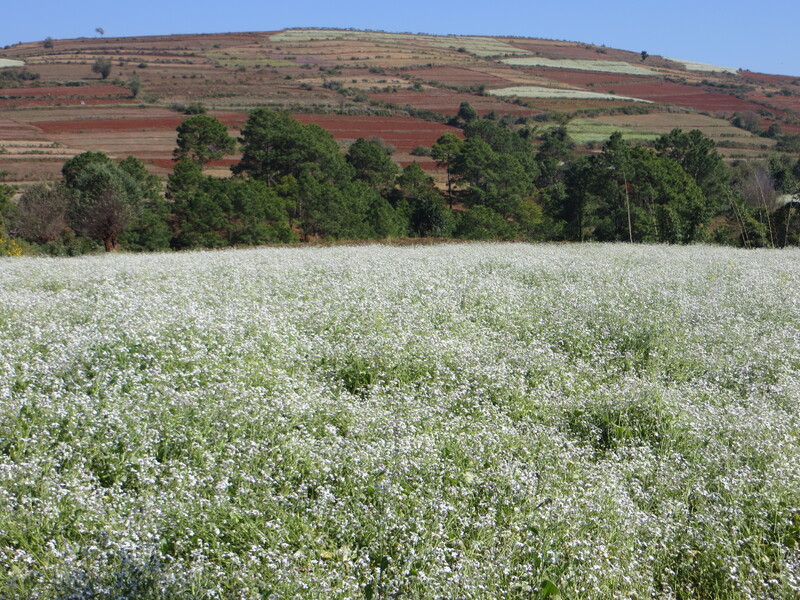 A word about our tour company, Grasshopper Adventures. We love them. 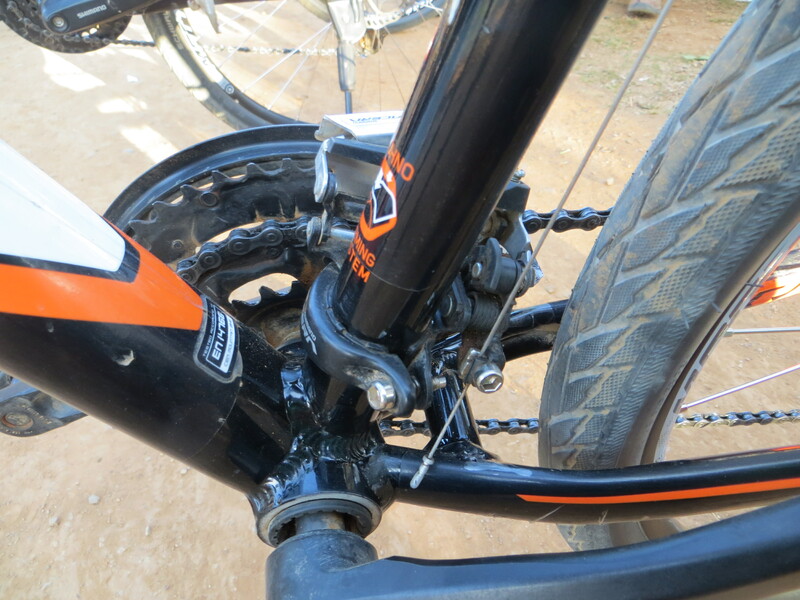 We did a couple day rides with them in Cambodia and thought they provided a great service. And then in Laos we used another company for a day ride that was pathetic – the tour guide couldn’t keep up with us, saying that he had an injured knee. So after maybe half of what we were supposed to ride he called the support vehicle to meet us and he rode in the tuk-tuk behind us – not a real fun way to ride. Grasshopper Adventures, though, has been great. We start riding, the van goes up about 20 kilometers to set up a snack break with fresh fruit, nuts, sweet things, water. 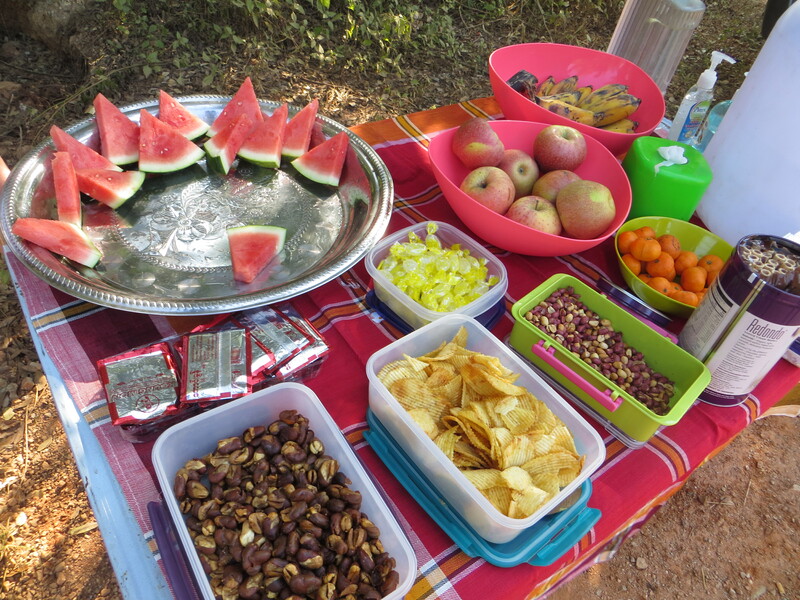 We ride another 20 kilometers (or sometimes less) and there’s another snack break set up. We get off our bikes, they refill our water bottles. We quit for the day and every day they clean our bikes and make sure the gears are working and all that. We pull into Mandalay for a two-day stop and they arrange to have our laundry done while we’re out exploring the city. Really a great experience so far. Feeding an elephant with beautiful tusks. Turns out they really like bananas. A quick summary of what we’ve done so far. 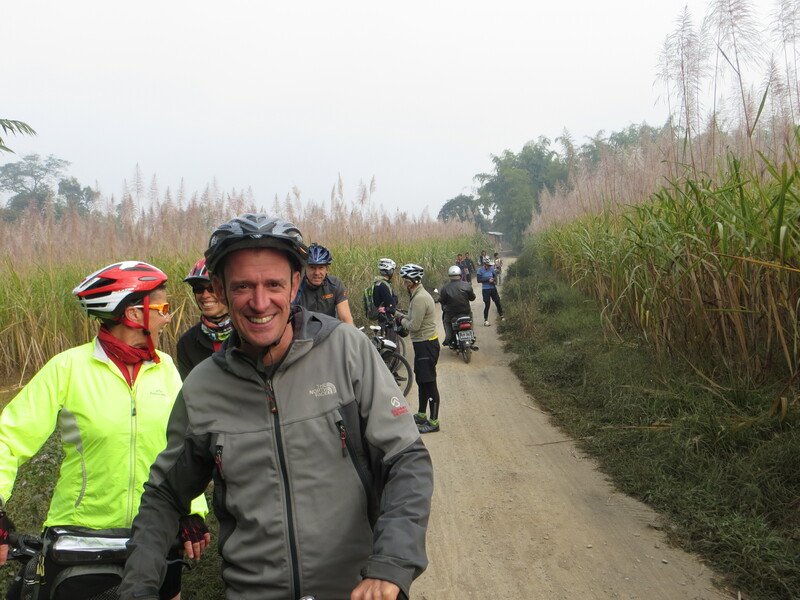 After our day on Inle Lake, we took on what was described as a “challenging” ride. They weren’t making that up. They’d warned us that we faced an 11-kilometer hill to climb but they somehow neglected to add that it was on a gravel/dirt road. That was brutal. And when we got done with that 11-kilometer climb? Well, the “rolling hills” we’d been expected turned out to be a lot more uphill on gravel roads. So we got our workout before pulling into the hill town of Kalaw, once a British hill station during the colonial era. They built it up there to escape the heat of the lowlands, and I can certify that they succeeded. I’m just amazed at how cold it can get in Myanmar. Next time I’ll bring a hat and gloves. 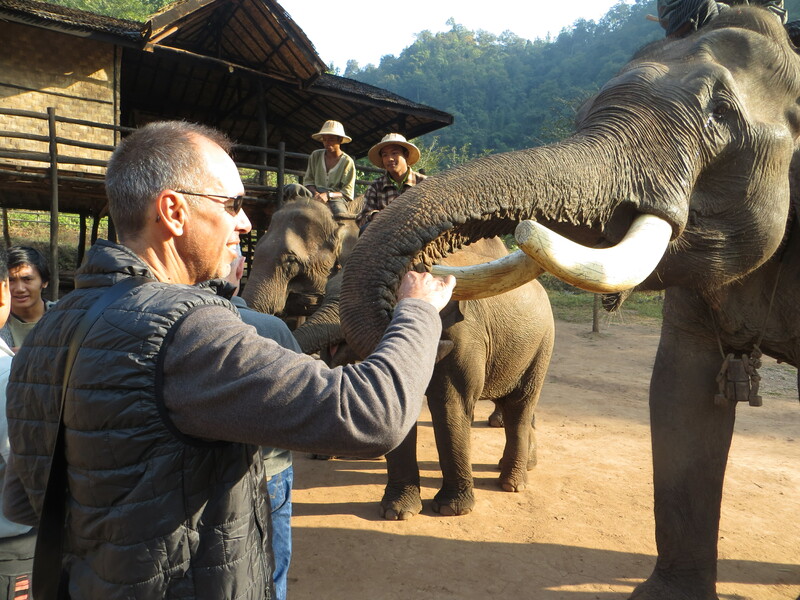 The next morning, before starting our ride, we spent the morning at the Green Hill Valley Elephant Sanctuary, a private preserve where they have “retired” and are caring for seven elephants who, until recently, were working in the logging industry. 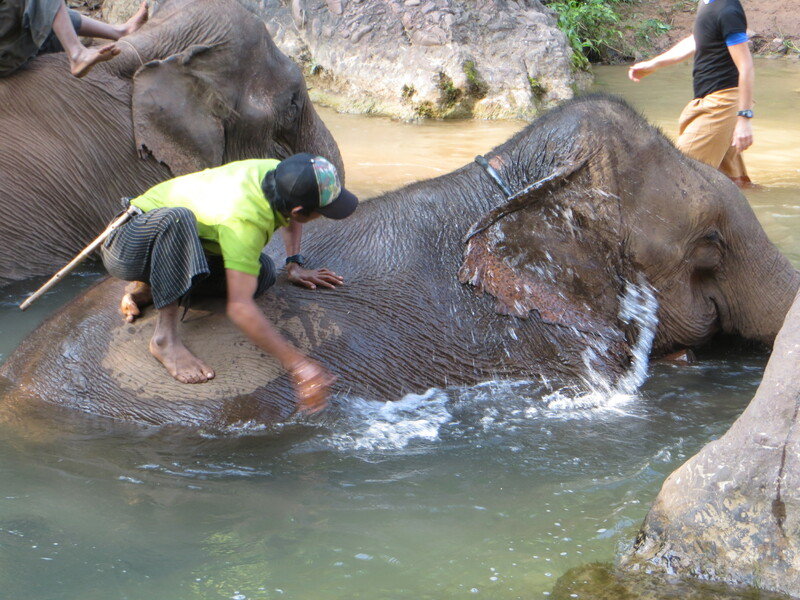 It’s not a tourist site where you ride the elephants or something, it’s just a place where they take care of old and wounded elephants. But a genuinely impressive attempt to care for these remarkable mammals in a beautiful setting. 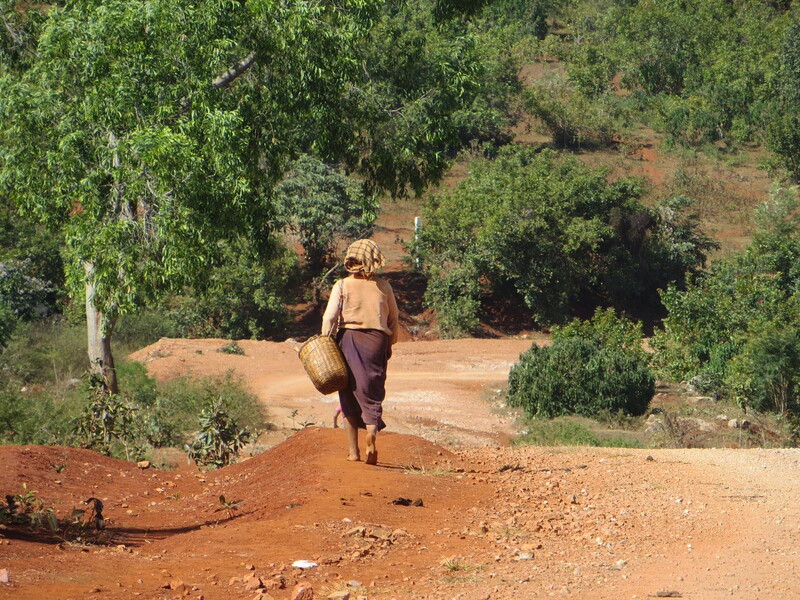 Then it was another ride through the countryside before arriving in Pindaya which, at an elevation of about 4,000 feet, was even colder than Kalaw had been. 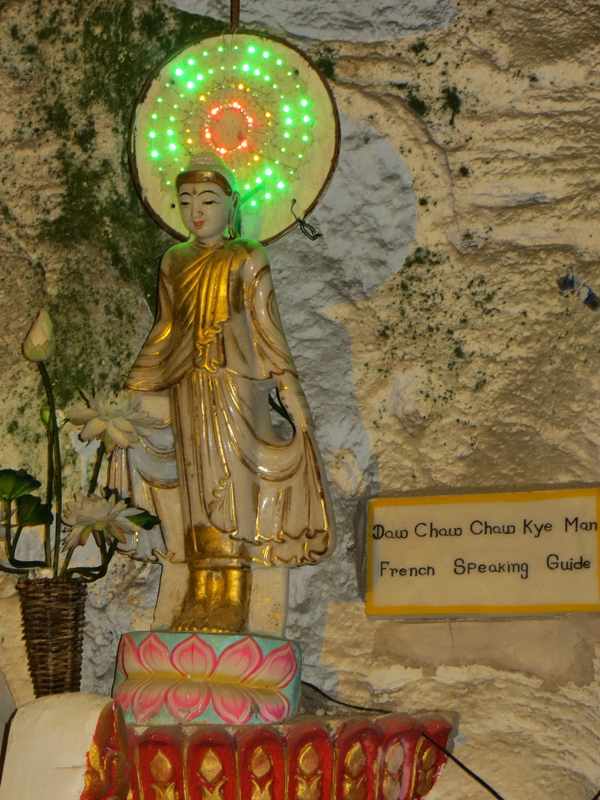 By now it was Christmas Eve, and the little hotel we were staying in near the Golden Cave – named after the more than 8,000 Buddhas placed in the cave – had a little fire in the parking lot for us to sit around as they poured us some homemade plum wine. Quite the celebration! 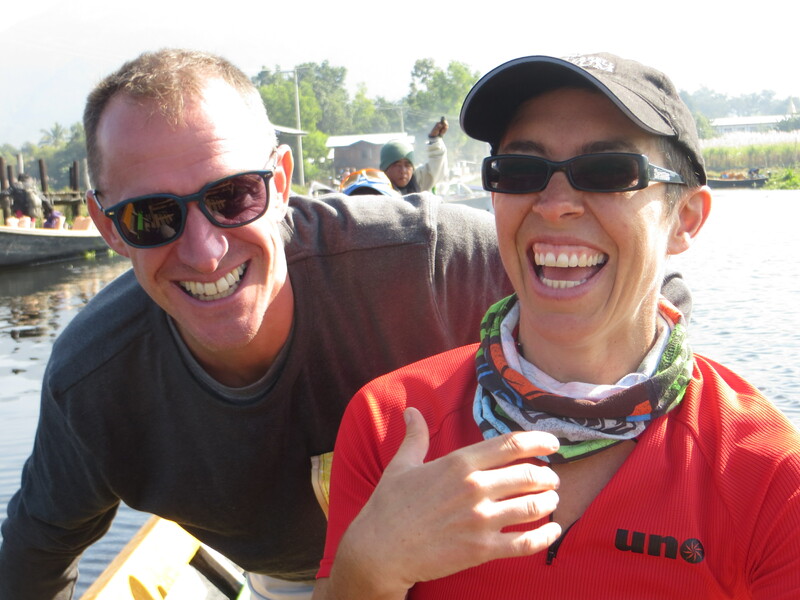 Finally, the next day was a long one – just over 100 kilometers. More downhill than up, but still quite the challenge. Not much to say about it except it was long and fantastically beautiful. And what a way to spend a Christmas Day, biking 100 kilometers across Burma. How often do you get to do that?? After a very long downhill ride we climbed into the van for the final drive into Mandalay where we had a not-at-all-traditional Christmas dinner. 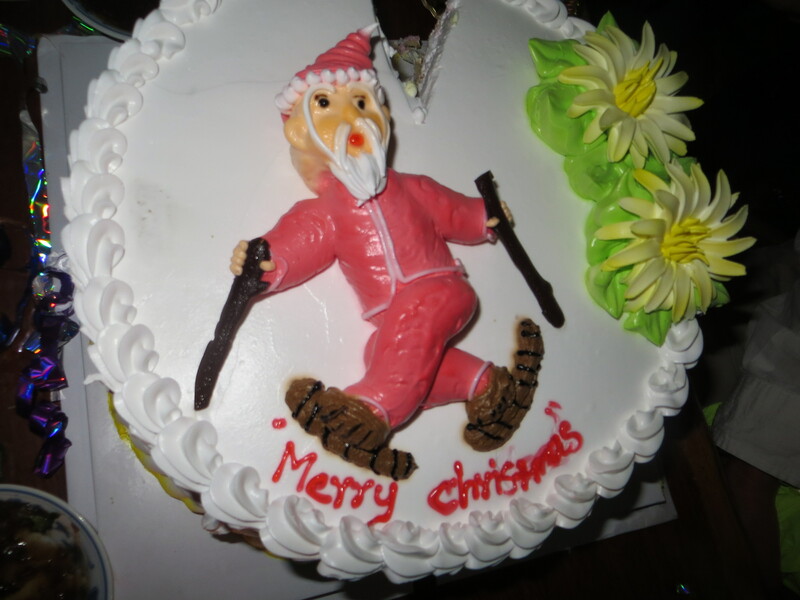 Since by now we’ve come to really enjoy our riding mates – Robin and Alison from London, Lisa and Barbara from Melbourne, and Marlene, who teaches English in Seoul but is from Maryland – it was a very warm and merry Christmas indeed. I felt as though I was on the Yellow Brick Road on the way to Oz when I rounded a corner and saw this. Everywhere you look here there are Buddhist stupas built on the top of hills. 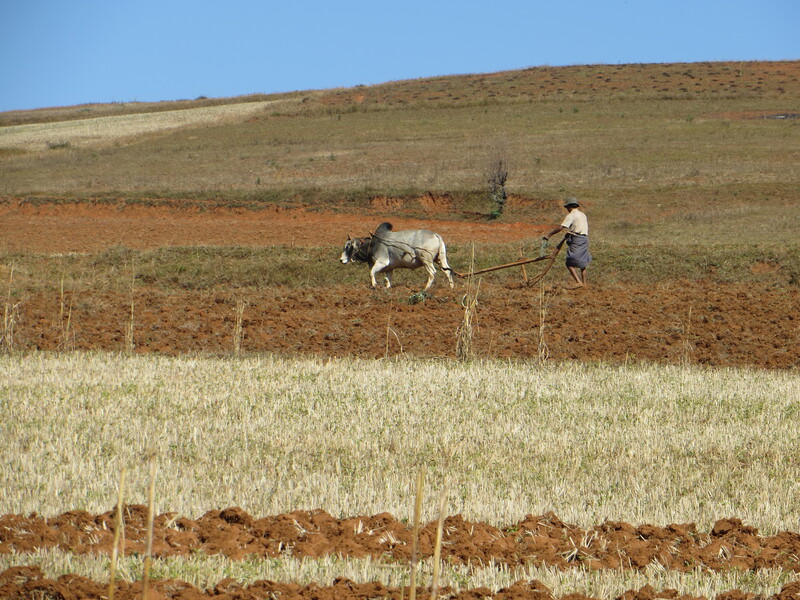 We ride past acres and acres of farmland that look as though not much has changed in the last few hundred years. This is how they get around here. Again, not much has changed. 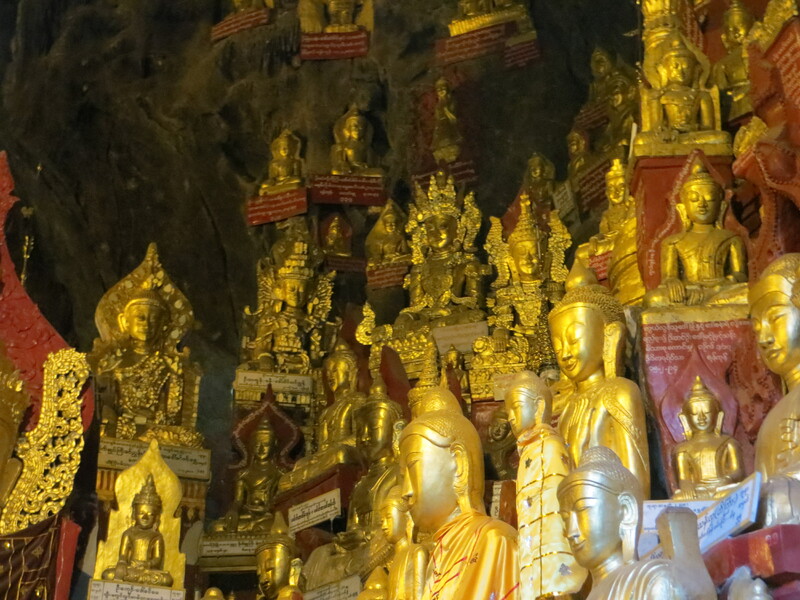 Many of the Buddhas have plaques telling who donated the statue. This one sure looks to me like it’s an advertisement if you need a French tour guide! We’ve started our Myanmar bike trip, known to one of our favorite stuffed animals as the Best Bicycle Bonanza in Burma! We’re starting slow: yesterday we flew from Yangon to Heho, a provincial capital about an hour north of Yangon, and then drove another hour to the small town of Nyaung Shwe where we’re staying for two nights. This morning we got on our bikes, but only for about 15 kilometers, spending most of the day on a boat tour of Inle Lake. Tomorrow, though, it gets serious, covering 75 kilometers, including an 11-kilometer climb up out of our valley and into the Western Shan Hills. 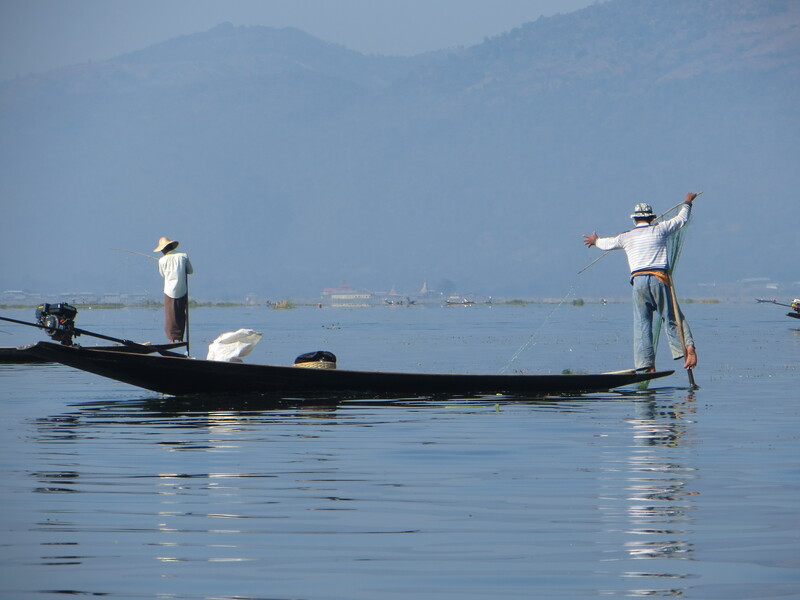 The highlight today was time spent on Inle Lake which, at about 45 square miles in surface area, is the second largest lake in Myanmar. It’s a beautiful, calm lake with large floating communities, gardens, and lots and lots of fishermen. The fishermen have a strange and unique style of boating: they stand on one leg at the back of the long, narrow boat. Their other leg is wrapped around the oar. That leaves their hands free to work while giving them the height advantage to see over reeds and other plant life that is all over the lake. Fascinating to watch. 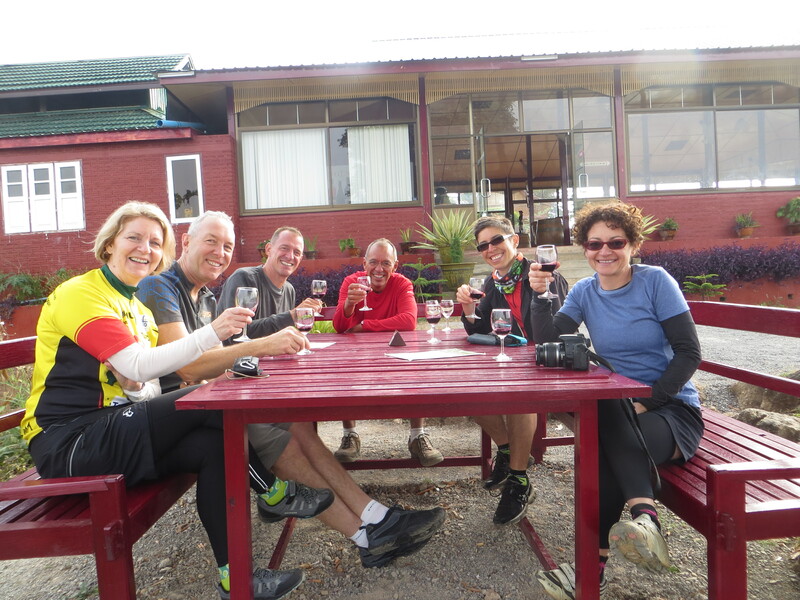 Early in the day, after biking just five or six kilometers, we stopped at a vineyard for a wine tasting. Really? Burmese wine? At 8:30 AM, barely after we’d started riding? It turns out Burmese wine is slightly better than you might expect, provided your expectations were extremely low. After that our trip included a stop at a satin weaving shop, where women were doing incredibly complex work on old-fashioned wooden looms, paid about $4 a day I was told. And then there was the Buddhist monastery, famous for the cats trained to jump and do other tricks. We were pretty excited about that, until we learned that the trained cats had pretty much all died out. There were still cats, and some adorably cute kittens, but no trained cats. Perhaps they were just an urban legend. So that was our first full day; a little biking, lots of boating. Tomorrow is a whole new ballgame. 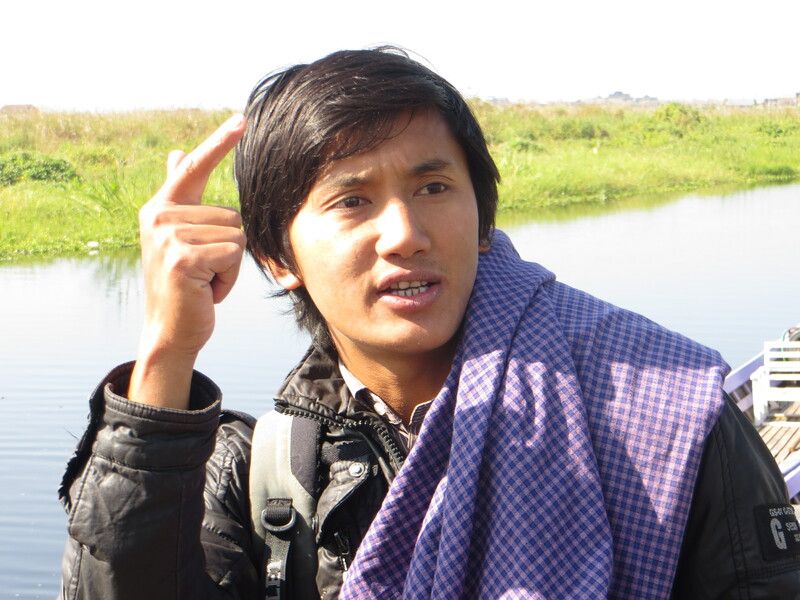 Nyaung Shwe is at about 3,000 feet altitude and we were shocked by how cold it was. 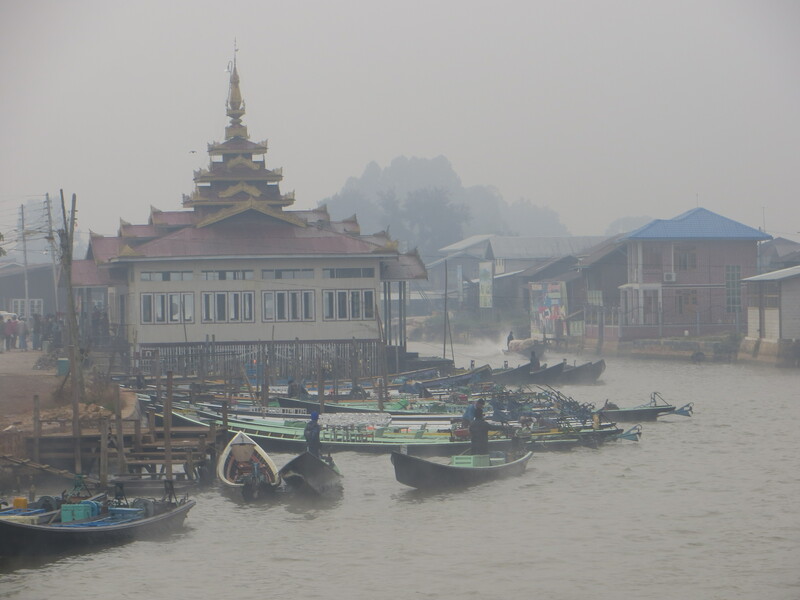 This is early morning on the canal that goes out to Inle Lake, all early morning mist. Mark and I are ready to go, all clean and fresh. We won’t stay that way, so we wanted it recorded that we started that way. Note the cold-weather wear – I’m wearing my down vest for the first time since Siberia and I needed it. Our short ride passed through endless fields of sugar cane. At a distance, the fronds on top made it look as though they were covered in frost, which wasn’t too implausible given the temperature. Here are six of us at our breakfast wine tasting. From left it’s Alison & Robin (London), Mark & me, Barbara (Melbourne), and Marlene (Seoul). Lisa, also kind of from Melbourne, was taking the picture. 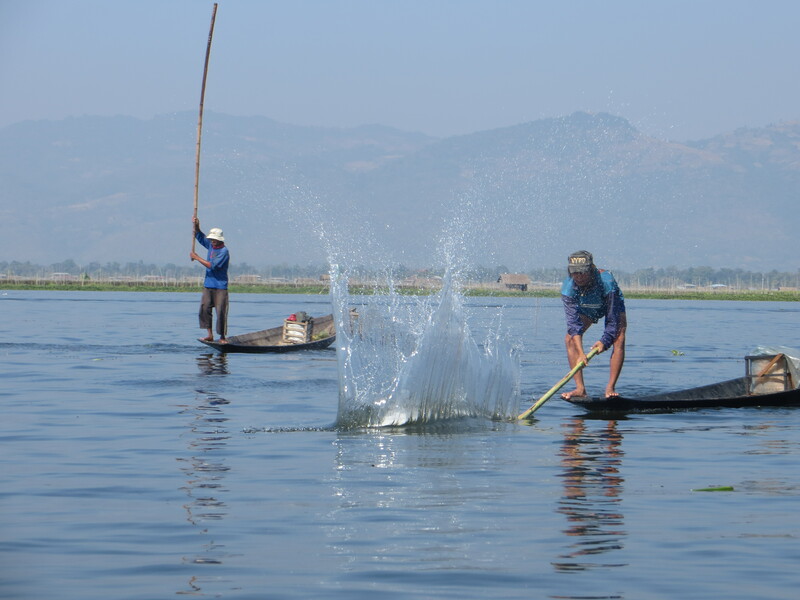 Fishermen on Inle Lake. You can see his leg wrapped around the oar while he’s using his arms to do whatever fishermen do. Here they are using long bamboo poles to slap the water – over and over and over again – to scare the fish into their nets. It has to be backbreaking work. However, I can attest that the local fish is great!